Storm surge December 2013: battle won…? 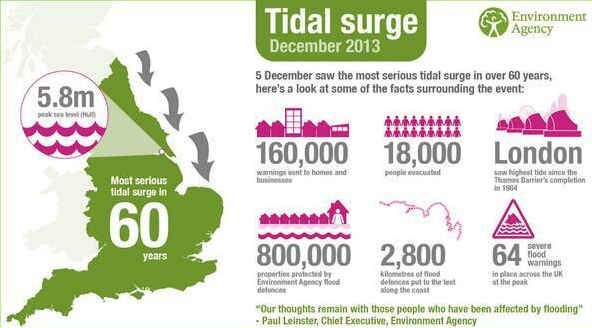 The 2013 December 5-7 North Sea storm caused “the biggest UK storm surge for 60 years” (UK Environment Agency). 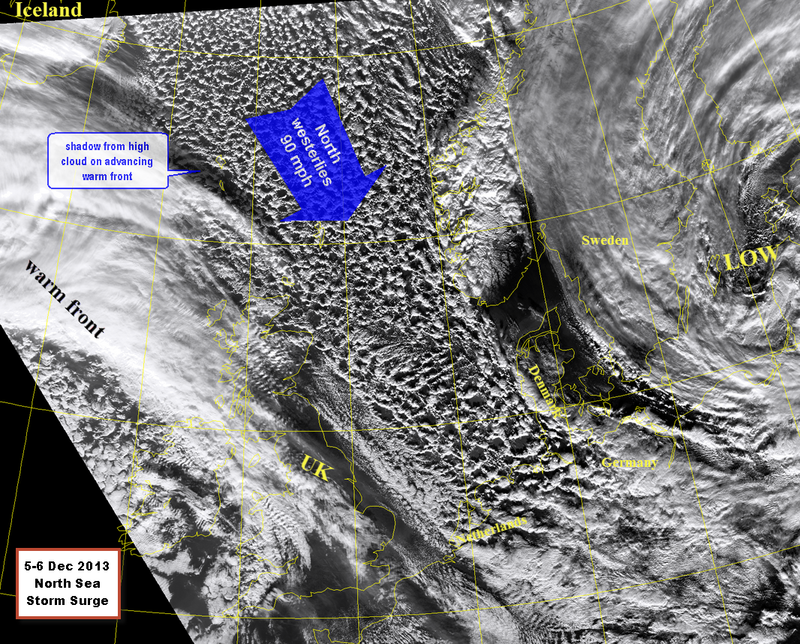 With associated gales across Scotland, coastal flooding in North Wales, Merseyside and the UK East coast, tidal river flooding in Hamburg, the closure of all major North Sea coastal surge barriers and disruptive snow further south in Europe, this storm system was arguably more powerful than StJude back in October. Thankfully, this storm only killed 7 people across Northern Europe (http://www.bbc.co.uk/news/world-europe-25243460). Essentially a storm surge is a higher-than-normal sea surface caused by low air pressure coinciding with high tides which, when thrown into shallow coastlines by winds, can produce exceptional coastal flooding. A surge can also include associated lower-than-normal water levels with off-shore winds pushing water away from the coast at low tide. 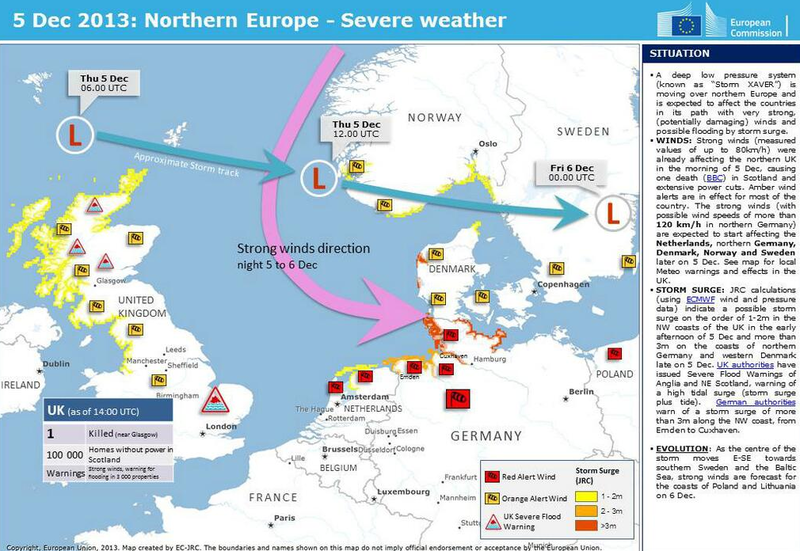 This post outlines the factors that makes the North Sea so vulnerable to storm surges and, further down, there is a summary of some impacts and a quick resume of the successful responses to this hazard event with some useful links. Finally, before we get too smug and chill out entirely about future storm surge hazard…will development land lapped-up on exposed coasts, for example in the Thames Gateway, increase our future vulnerability in the face of sea level rise and climate change? Is it sensible to build in these locations? Animation shows storm surge rolling round the coast and into the North Sea. 2. Sea depth/ bathymetry: the North Sea gets shallower towards the bays and wetlands towards the south. These shallows have the effect of increasing the height of tides and surges as they are forced up over submerged shelves into narrowing bays. This is possibly why Boston, Lincs and Hamburg suffered some of the worst flooding because surges were forced up bays and rivers. 3. Intense low air pressure: A 1 millibar reduction in air pressure allows sea level to rise by 10mm. This effect can be replicated by sucking water up through a straw. The storm that crossed to the north of Scotland on 5 December had a central pressure of 976mb that deepened to 968mb over the North Sea. This is a similar central pressure to the storm that caused the 1953 storm surge that killed 307 people in the UK and 1800 people in the Netherlands. 4. Storm track: the LOW pressure has to track east over north of Scotland, which will drive a surge of water into the North Sea that is then pushed south by vigorous onshore Northerly winds into the low lying east coast of UK. Ideally, the storm should deepen on its’ track across the North Sea, thus allowing northerly winds to gain in strength driving the surge and associated wind waves south. 5. High tides: high spring tides are the final requirement for the biggest surges. Tides migrate as a bulge of water around the coast and, for the worst impacts, any surge travelling south down the North Sea must match the dome of the highest tide to produce the highest water levels in any one place. Since high tides occur twice a day it is quite likely that high elements of the surge will match a high tide level somewhere down the east coast. 6. Wind driven waves: Finally, surge and tide heights can be increased yet further by strong on-shore winds producing locally high wind driven waves that can over-top sea walls. The impacts of the 2013 storm surge included flooding in coastal towns on the east coast of the UK with perhaps worst hit being Boston in Lincolnshire. Houses on some vulnerable stretches of coasts such as Hemsby were washed into the sea as waves eroded sand dunes. There was also significant flooding in Rhyll, North Wales and along the Merseyside coast at New Brighton (note: not Brighton!) where a Morrisons supermarket was flooded. The worst impacts on major populations and cities were avoided by the raising of the Thames Barrier to defend London and the closure of the flood gates on the Delta Scheme in the Netherlands. The storm was modeled over a week prior to impact. 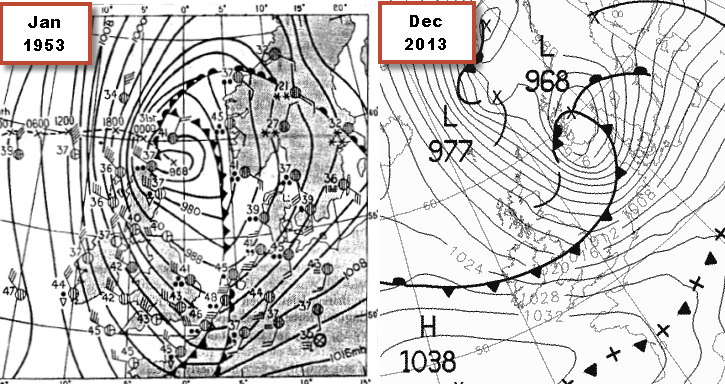 Initially GFS and UKMO models were seeing a cold surge as the main factor bringing possible snow across the UK but from about 6-7 days out it became increasingly obvious that the exact track and orientation of the LOW meant that powerful northerly winds and a possible storm surge were the greatest risk. The UK Met Office, with Environment Agency, then started preparations for warning those at risk from flooding. Most news channels were airing significant coverage from 24 hours out. Significant flooding did occur along the East coast, notably in Scarborough in Yorks, Boston in Lincs and Hemsby in Norfolk. In Hemsby some vulnerable houses located on the sand dunes were washed into the sea. Bridges near the sea were shut for a time, like the Humber Bridge; and rail services in some eatern counties were disrupted for a time. Power was cut to homes in Scotland due to high winds. Hundreds of residents were evacuated prior to the floods in various locations but some claimed to have little warning. The worst impacts were successfully controlled by the massively impressive engineering schemes built since the devastating 1953 floods.London has nearly 200 miles of flood walls and 8 barriers holding back the tidal Thames. The Thames Barrier was opened by the Queen in 1982. The Eastern Scheldt storm barrier was closed for the first time since the 1970’s. The Netherlands barriers are built to withstand a 1 in 10,000 year storm surge event so it is perhaps unsurprising that they easily saw off this event. It is also noteworthy that the Dutch have great faith in their storm surge protection barriers. These measures, along with warnings and on the ground assistance for places that were flooded, proved extremely effective. The sting in the tale? London is sinking into clay and, along with the rest of the SE, it is tilting into the sea partly due to an epeirogenic / isostatic adjustment taking place since the glaciation released the north of the country from the burden of millions of tonnes of glacial ice causing positive isostatic rebound in the north and related subsidence in the south. Flood plains and reclaimed land exposed to storm surges are still being lapped up by hungry developers as places ripe for building, like the Thames Gateway in London. But is it sensible to concentrate massive new urban development in low lying areas vulnerable to coastal flooding when we have sea level rise and climate change?